the space or figure formed by two diverging lines, measured as the number of degrees one would have to be moved to coincide with the other. acromial angle that between the head of the humerus and the clavicle. alpha angle that formed by intersection of the visual axis with the optic axis. 1. the tooth angles between the buccal surface and the other surfaces of a posterior tooth; see accompanying illustration. 2. the cavity angles between the buccal wall of a tooth cavity and other walls. cardiodiaphragmatic angle that formed by the junction of the shadows of the heart and diaphragm in posteroanterior radiographs of the heart. cavity a's the angles formed by the junction of two or more walls of a tooth cavity, named according to the walls participating in their formation. cavosurface angle the angle formed by the junction of a wall of a tooth cavity preparation and a surface of the crown of the tooth. costovertebral angle the angle formed on either side of the vertebral column between the last rib and the lumbar vertebrae. 1. the tooth angles formed between the distal surface and the other surfaces of a tooth; see accompanying illustration. 2. the cavity angles between the distal wall of a tooth cavity and other walls. filtration angle (angle of the iris) the angle between the iris and cornea at the periphery of the anterior chamber of the eye, through which the aqueous humor readily permeates. angle of jaw the junction of the lower edge with the posterior edge of the lower jaw. 1. the tooth angles formed between the lingual surface and the other surfaces of a tooth; see accompanying illustration. 2. the cavity angles between the lingual wall of a tooth cavity preparation and other walls. angle of Louis an anatomical landmark located on the sternum; it can be felt as a notch or ridge at the top of the sternum. 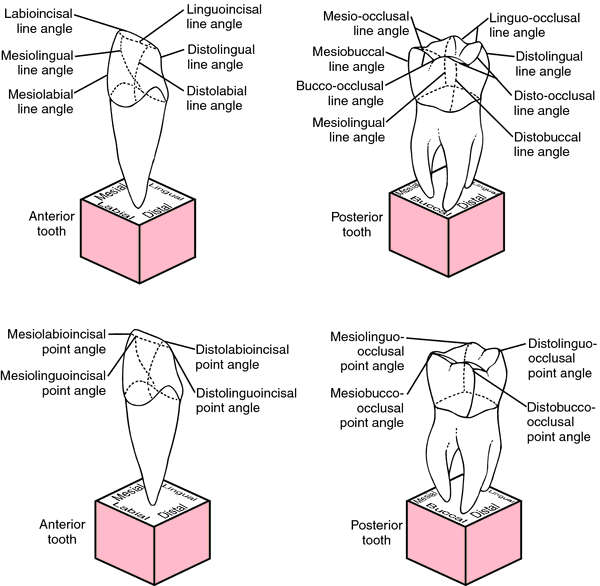 1. the tooth angles formed between the mesial surface and other surfaces of a tooth; see accompanying illustration. 2. the cavity angles between the mesial wall of a tooth cavity and other walls. meter angle the angle formed by intersection of the visual axis and the perpendicular bisector of the line joining the centers of rotation of the two eyes when viewing a point one meter distant (small meter angle) or the angle formed by intersection of the visual axes of the two eyes in the midline at a distance of one meter (large meter angle). angle of pubis that between the pubic bones at the symphysis. sternoclavicular angle that between the sternum and the clavicle. Tooth angles: Top, line angles; Bottom, point angles. From Dorland's, 2000.
visual angle the angle between two lines passing from the edges of an object seen, through the nodal point of the eye, to the corresponding edges of the image of the object seen. the amount of convergence required to view binocularly an object 1 m distant and exerting 1 diopter of accommodation. The amount of convergence required to view binocularly an object 1 meter distant and exerting 1 diopter of accommodation.